When you arrive, park your vehicle and explore Yosemite with two wheels. 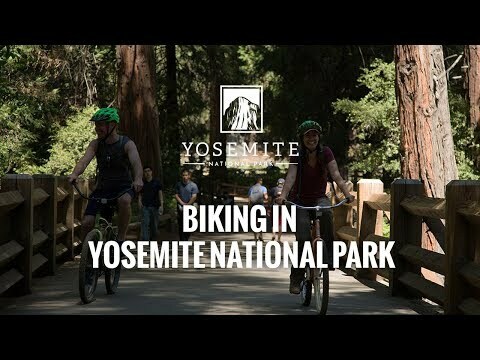 Biking is one of the easiest, most fun ways to ensure you see all the highlights at Yosemite National Park. Yosemite Valley is flat, which makes for easy riding along our 12 miles of designated paths. All rental bikes are available first-come, first-served – reservations are only available for ADA bicycles (hand-crank bicycles, and tandem bicycles for visually impaired guests). Before you begin your biking trip, be sure to review the trail map and familiarize yourself with our biking rules. Bicycles, tag-along bikes for children, trailers, and helmets are available for all ages and abilities. We also offer a select number of tandem bikes and hand-crank bikes for guests with physical limitations. Yosemite Valley Lodge Bike Stand is located next to pool. Half Dome Village Bike Rental Kiosk is located next to the Half Dome Village Front Office. * Hours may vary based on weather. Call for current hours. ADA Bike Rentals Each rider will be provided an orientation regarding bike trails and use of a hand crank bike that will accommodate anyone with only the use of their upper body. All two seated bikes are reserved for visually impaired riders. Advanced reservations required for rental. Ride from the Half Dome Village, past the Stable, and on to Mirror Lake. Park your bike before Mirror Lake in the designated bike stand and walk the rest of the way in. Enjoy a leisurely afternoon by the water, having a picnic, and relaxing as you take in the gorgeous surroundings. On the way back, stop by the stable and visit the friendly horses and mules. Estimated round trip: 2 miles. From Yosemite Valley Lodge bike stand, follow the bike path across the meadow and over the bridge toward the Chapel. Continue past Yosemite Conservation Heritage Center to Half Dome Village for a pizza or ice cream. For an easy loop around the Valley, head back to Yosemite Valley Lodge by following the signs to Yosemite Village. Ride only on paved bicycle paths. Bicycles are not allowed on trails. Riders younger than 18 are required to wear a helmet at all times. However we strongly recommend that all bike-riders wear helmets at all times. Let pedestrians know when you’re passing them. Rental bikes are not permitted on Mirror Lake Hill and Lower Yosemite Falls Trail. When riding in groups, please ride single file on the right hand side of the path. Only one rider is allowed per bike. Passengers not permitted including babies. Rental bikes must stay in Yosemite Valley.